The term sash window is used almost exclusively to refer to windows where the glazed panels are opened by sliding vertically or horizontally. To facilitate operation, the weight of the glazed panel is usually balanced by heavy steel, lead or cast – iron sash weights concealed in the window frame. The term sash windows is used interchangeably with the term box sash windows in the UK. Historically, box sash windows are heavier and more stately in nature than modern sash windows, but both terms are used in the industry to refer to the same type of window. The oldest surviving example of sash windows were installed in England in 1670. The invention is sometimes credited to Robert Hooke, but others see it as a Dutch invention. Used extensively in properties during the Georgian, Victorian and Edwardian era, there are various subtle differences in arrangement of the panels and no standard rule as to the size of the windows. In recent times, it has been necessary for many of these windows to have been changed and modernised to UPVC where the woodwork has rotted or distorted. Continuous upkeep is needed where original windows remain. On a practical level, shutters will help insulate the window, which is ideal for single glazed windows. Adding another defence against heat loss and noise, shutters will also provide shade in a hot spell but, as opposed to blinds, the window behind the shutter can be open to allow air flow. No one shutter range or style is best for a sash window as these windows can be dressed to personal requirements. 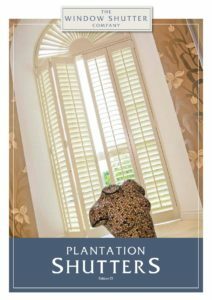 We can provide louvred plantation shutters or a classic Solid raised option dependent on the needs of our client. All of our style options: Full height, Café style or Tier on Tier are available. 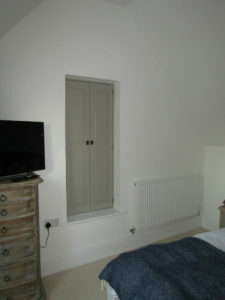 We will take the time to find out how you wish to use your shutters and advise accordingly. 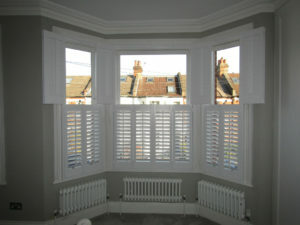 A solid shutter will add a classic look to any design but gives you the least flexibility. The shutters are either open or closed, with nothing in between. They do however provide more light closure than louvred shutters. Louvred shutters on the other hand allow light in as required and can offer privacy without darkening the room too much. 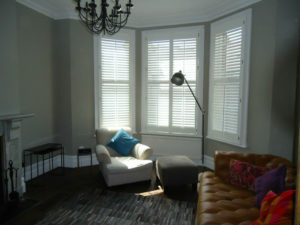 Common in Victorian, Georgian and Edwardian terrace properties, with original box sash windows, café style shutters work well as an alternative to net curtains, but will need additional dressings for full closure at night. 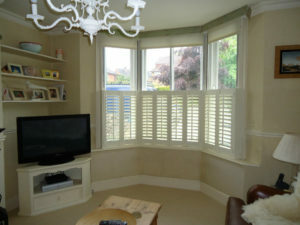 Full height shutters are the most flexible of dressing and are suitable on nearly all occasions. They provide you with complete control over the degree of light let into the room and your privacy. Tier on Tier is a classic design often used as the best of both worlds so that the top section can be opened whilst the lower section remains for privacy. Tier on Tier however has limitations and constraints – for example, where do the panels fold back? Are the windows too wide or too short? Are there sufficient mounting options. Will the top tier actually be opened often? These things have to be addressed at design to avoid issues at installation.